Yes! You can personalize your note cards! But you might not know what that looks like or what's possible. Our default option is the same type face we use on our X-mas cards, Bradley Hand, and whatever words you select printed under the dog (or whatever image) as shown above. The words can be your name (The Beagle upper left), your organization (the German Shepherd in the middle), your pet's name (the Golden on the right) or a phrase (Boston, lower right). 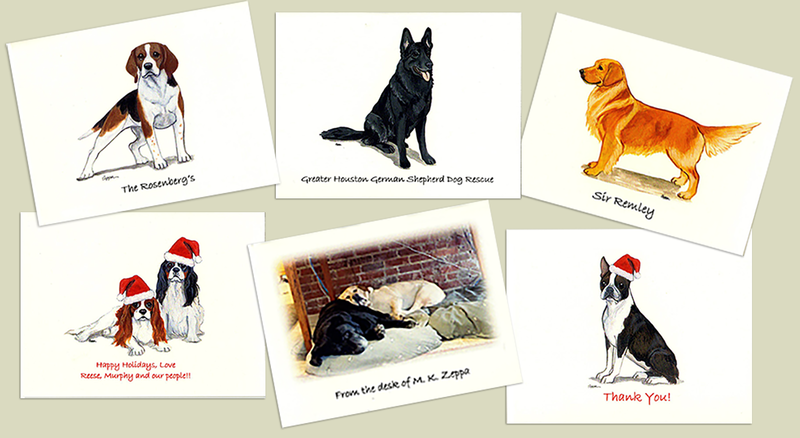 We can personalize our Christmas cards as well (Cavaliers bottom left). And we can personalize your custom cards (from a photo you submit), sample middle bottom. We can print on the inside...contact the studio for a personalized quote. Or for any other special graphic design requests.